I LOVE LOVE LOVE lists. Love. The thing is that I'm supposed to be focusing on "being" not "doing" all the time. Being in the present. I tend to live in the future. Which results in me being a total worry wart. Because the future is unknown. And the unknown is scary for a control freak like me. And fear leads to anxiety. But lists about the future make me feel like I'm taking back some control. Hence, I've always loved lists. Unfortunately, the lists don't really help with anxiety in the long run. They just keep me focused on the future. So I'm trying to tone it down on the lists. That being said, I'm also working hard on using mindfullness to shift my perception of my situation. And one of my "situations" is that winter is brewing. And winter in Winnipeg, when you are cold all the time to begin with (see my blood analysis post that confirmed my blood is "sticky" and not circulating properly so I REALLY AM ALWAYS COLD), is pretty tough. As soon as the first frost hit this week I could feel my brain going to that negative place of dread. So I need to work on shifting my perception of my situation. I do a summer bucket list each year. Which I really enjoy. Of course I do.....its a list. But really, who needs a bucket list for summer. Everyday is easy to look forward to. Summer is full of sunshine and adventure by nature. 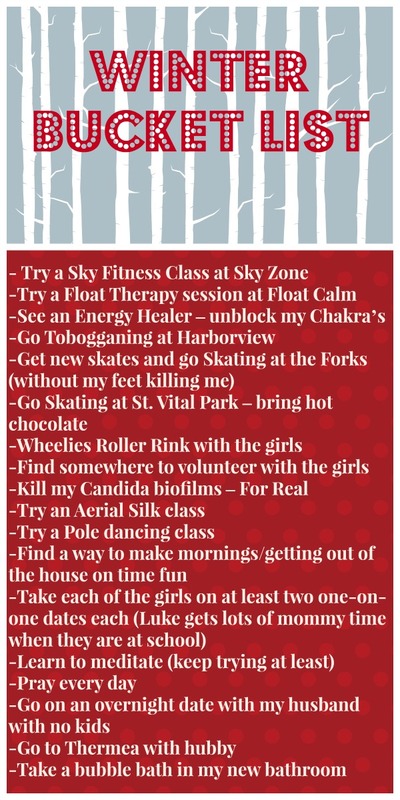 So I decided that it's okay if I make a Winter Bucket List. Its a list. Its kinda making me focus on the future. But in a good way. Its also helping me shift my perception of winter. Because there are really a lot of great things about winter too! I actually had to stop myself from going too crazy - as to not set up unrealistic expectations and find myself trying to check off the boxes rather than enjoying the journey. So here is my list. A list of things I'm going to look forward to doing. And be fully present when I'm doing them. And I'm actually not going to care if I don't get through it. For the record I didn't quite finish my summer bucket list - and I was okay with it - mostly. I'm making progress! And if this doesn't work, I'm scraping my list and were heading down south for a couple of weeks in February.